FILE - Singer Morrissey performs at Hollywood High School on March 2, 2013 in Los Angeles, Calif.
Friday will be "Morrissey Day'' in the city of Los Angeles. The "There Is a Light That Never Goes Out" and "How Soon is Now?" singer, who will be performing two shows at the Hollywood Bowl this weekend, will receive a certificate from the city at the bowl during his Friday night show. "Morrissey Day honors the man who put the 'M' in Moz Angeles, an icon whose music continues to touch and uplift countless people across the globe," City Councilwoman Monica Rodriguez said. "Morrissey uses his voice to raise awareness for many social issues while 'in his own strange way,' always staying true to his fans." Morrissey — who was born Steven Patrick Morrissey — is the former singer for the influential rock band The Smiths and has had a successful solo career since the band broke up in 1987. 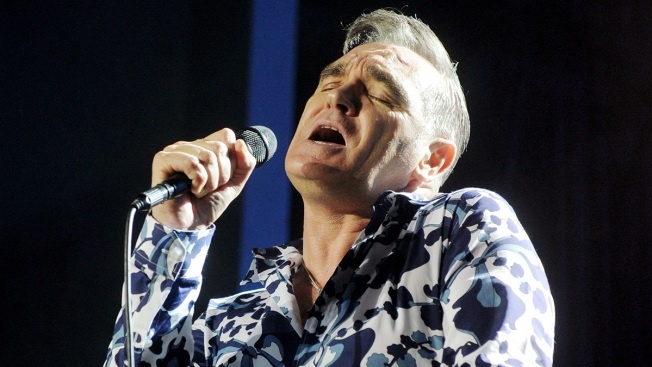 Since disbanding The Smiths, Morrissey, 58, has had all 10 of his records enter the United Kingdom charts in the top 10, including three at No. 1. "Los Angeles embraces individuality, compassion and creativity, and Morrissey expresses those values in a way that moves Angelenos of all ages," Mayor Eric Garcetti said. "Morrissey Day celebrates an artist whose music has captivated and inspired generations of people who may not always fit in — because they were born to stand out." Morrissey Day is just one way the singer is being specially honored during his stint in Los Angeles. For the first time ever, the Hollywood Bowl will change its menus to all vegetarian for Morrissey's performances, as the singer is a longtime vegetarian and animal rights advocate.